Sargun Kaur, Japneet Kaur, and Biney Kaur are good friends. 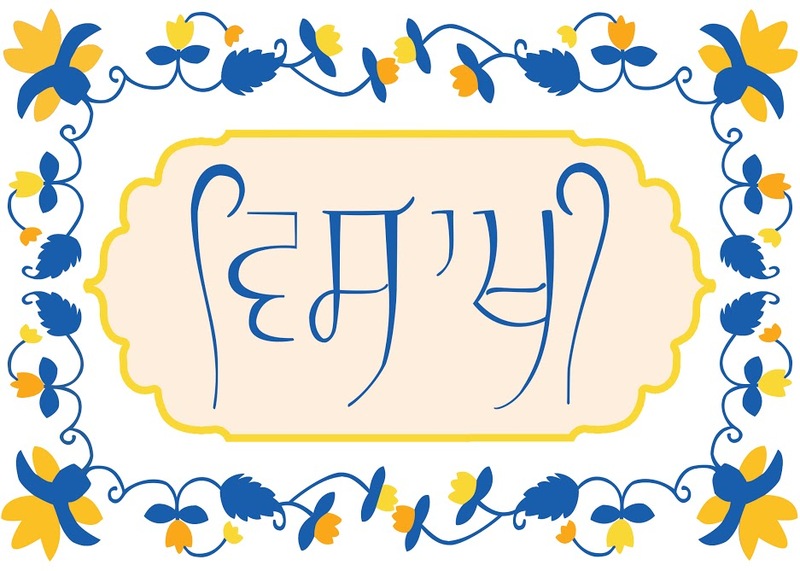 They came together to pour themselves into a line of Vaisakhi greeting cards which are available for purchase online for people in the U.S. and Canada! What was the inspiration behind the Vaisakhi greeting cards? Letter writing now is only spoken of in Harry Potter references or our parents’ love letters. It has become such a rarity to send or receive a thoughtfully hand-written note, especially for our mostly digital generation. Each of us has a love for journals and planners, for physical artwork which can be held in our hands, and for paper in general (elements of stationery we hope to one day bring to life – linen paper, letterpress, gilded edges, and so on). So we decided to bring these passions together into a collective effort, and before we knew it we were staying up until 6 AM everyday and dreaming in Photoshop. In retrospect, it almost seems poignant that the birth of this collective occurred in honor of the birth of the Khalsa, if you’re into teasing meaning out of things! What is the historical/religious significance behind each card? “The Call” is a very literal throwback to 1699, when Guru Gobind Singh Maharaj called for five heads, the Panj Sees. 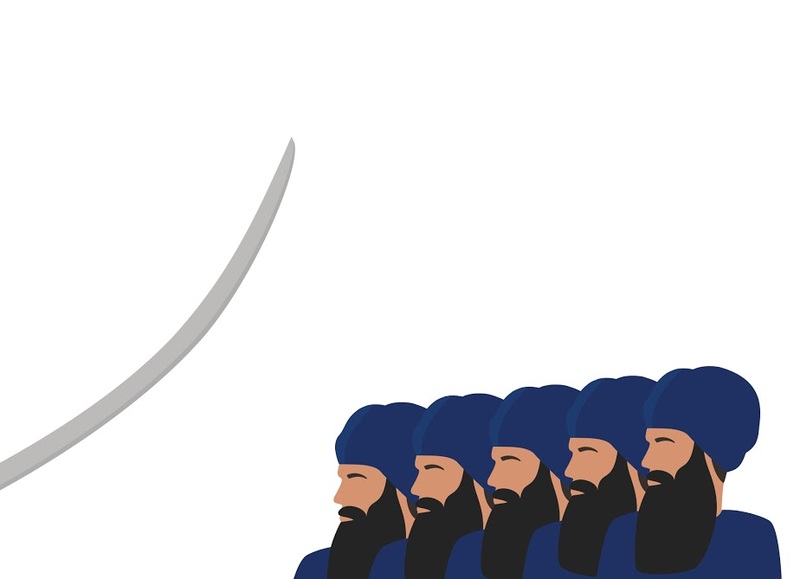 It’s also a question we ask ourselves every Vaisakhi – “are we ready to answer that call if it comes again?” We really wanted to focus on this vital concept, so we kept the design minimal, with all the focus on the five Singhs and Guru Gobind Singh Ji Maharaj’s talwar. “Vaisakhi de Rang” is a reflection of the Vaisakhi season and Punjabi culture. Vaisakhi marks the harvest season, and it is culturally a time when many Punjabis and Sikhs celebrated rebirth, and the abundance of their harvests and livelihoods. We focused on creating icons representative of the season. For example, the tractor, baldh (ox), and daathi (sickle) are used in planting and harvesting crops, the staple crop being kanak (wheat). 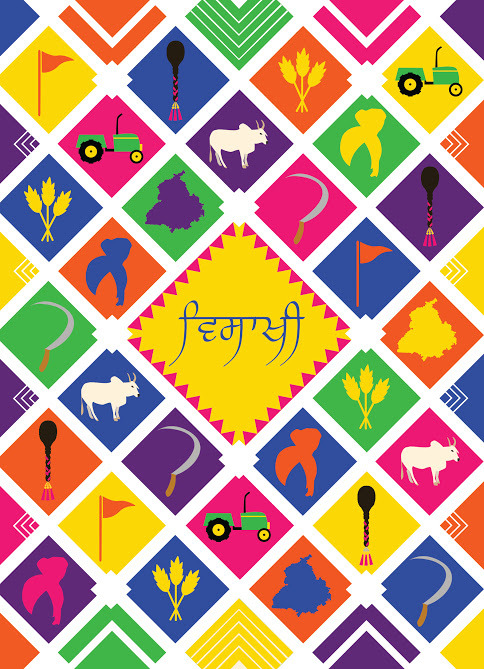 We also incorporated iconography that we hope reflects the general culture of Punjab, including the parandhi, a turlay vaali pagh, a Nishan Sahib, and post-partition Punjab. “Motif” was intended to allow senders to purposefully interpret and convey Vaisakhi’s personal significance to them. That’s why we focused on typography, and the design of the card was inspired by the beautiful calligraphy and floral motifs found in Angs written by Guru Gobind Singh Ji Maharaj’s own hand. Why do you celebrate Vaisakhi? For us, Vaisakhi is so important because it signifies the birth of the Khalsa, the birth of our community. Everything we are and should aim to be has descended from that very deliberate act in 1699 by Guru Gobind Singh Ji Maharaj. It was the time of the first Amrit Sanchar, which for some of us reminds us of our own Amrit Sanchars. It gives us josh. Please share why you selected to share 30% of the proceeds with the organization Ensaaf? Ensaaf is a nonprofit organization that works to achieve justice for mass state crimes in India, with a particular focus on Punjab. Given the nature of this particular project, we felt very strongly about supporting a Sikh cause or organization. Growing up at Fremont Gurdwara Sahib and being surrounded by family and friends who struggled and suffered in brutal ways, we’ve always been cognizant of the consequences of the state crimes against Sikhs. With the crucial work Ensaaf does, we felt like this was the very least we could do to support our Sikh brothers and sisters dedicating their life to justice for the Sikh nation. That being said, Ensaaf is in no way involved with the production or sale of these cards, and does not endorse these cards in any way. We simply wish to give back in the spirit of Sikhi and our community. The cards can be purchased at www.shop.beingbiney.com, www.shop.sargunkaur.com, or shop.japneetkaur.com.